Just about every time the monthly jobs numbers comes out, economic research firm TrimTabs comes out and slams the government’s methodology, usually honing in on the Birth/Death model of new businesses entering the market. Frankly, we’re not sure what to make of their arguments. We’ve been hearing about this Birth-Death issue for a long time, but unless you believe they’re changing their methodology from month to month, then that issue only goes so far. Something’s Not Right in Kansas! Seasonal adjustments are particularly problematic around the holiday season due to the large number of temporary holiday-related jobs added to payrolls in October and November which then disappear in January. In the past two months, the BLS seasonal adjustments subtracted 2.4 million jobs from the results. In January, when the seasonal adjustments are the largest of the year, the BLS will add anywhere from 2.0 to 2.3 million jobs. In our opinion, trying to glean monthly job losses numbering in the tens of thousands or even in the hundreds of thousands are lost in the enormous size of the seasonal adjustments. The large divergence between the two results begs the question of what is causing the difference. While we don’t have an answer today, we will be poring over the data in an attempt to answer that question. 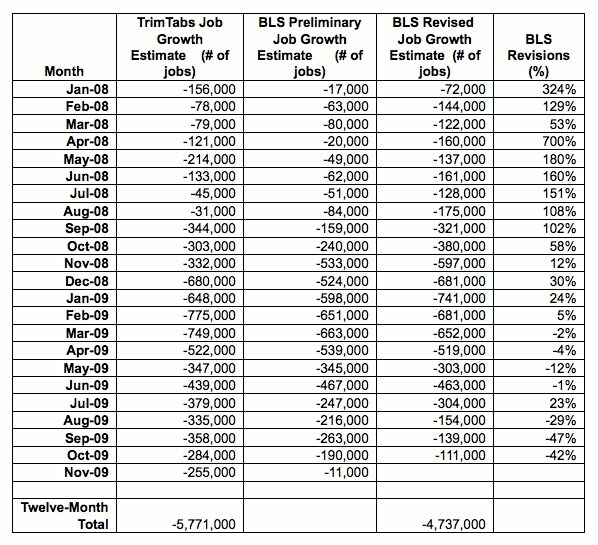 A comparison of TrimTabs’ employment results versus the BLS’ results from January 2008 through November 2009 is summarized below. Automatic Data Processing reported on Wednesday that 169,000 jobs were lost in November. The Institute of Supply Management (ISM) Non-Manufacturing Survey reported that the majority of companies surveyed were still shedding employees. Weekly unemployment claims were 457,000 in the week ended November 27, 2009. While last week’s results were below the important psychological level 500,000, the weekly claims are still uncomfortably high and point to a contracting labor market. The TrimTabs Online Jobs Index reported lower online job availability in the past three weeks. We will have the opportunity to truth our employment model estimates at the end of January 2010 when the BLS releases its annual benchmark revisions. The BLS revisions are based on actual payroll data for March 2009. The BLS revision is then divided by twelve to correct prior month’s data back to April 2008. We also use the March 2009 revisions to adjust our model inputs and make any necessary corrections. Perhaps we should change the BLS(Bureau of Labor Statitics) to BLS (Blatant Lies of Stupidity). Yep. This deception is getting to be pretty outrageous. They will tout around the 11,000 figure until somebody 'tips the hand'.